Haunting visions lead a psychic boy into an otherworldly war between a legendary gunslinger and a mysterious man in black. 11-year-old Jake Chambers suffers from ongoing nightmares of a gunslinger, Roland Deschain, battling a mysterious man in black, Walter Padick, who seeks to destroy a dark tower at the center of the universe. Jake tries explaining to his mother Laurie that recent earthquakes in New York are tied to Walter’s attempts to bring down the tower using children with psychic abilities. Jake’s psychiatrist Dr. Hotchkiss insists that Jake’s visions are related to stress from the death of his dad. One of Jake’s visions shows Walter using sorcery to kill Roland’s father Steven during a great war, leaving Roland as the last of the gunslingers because he is immune to Walter’s magic. Another vision depicts an old house, which Jake later traces to Dutch Hill, Brooklyn. Jake’s mother Laurie and stepfather Lon insist on committing Jake to a psychiatric clinic. When Jill and Toby from the clinic arrive to pick him up, Jake recognizes them as minions of Walter wearing human skin as a disguise. Jake flees. Jill and Toby chase Jake, but he escapes to the old house in Dutch Hill. In the old house, Jake finds a strange keypad. Inputting numbers seen in a dream causes a portal to open. Jake escapes a demonic manifestation and enters Mid-World. Walter oversees his technician Pimli as more children are harnessed to attack the tower. Another technician, Tirana, reports to Walter about the unauthorized portal crossing into Mid-World from Keystone Earth. Jake meets Roland. Roland decides to take Jake to a seer to learn more about his visions of Walter and the tower. Water journeys to New York to confer with his acolyte Sayre about the portal crossing. Walter is led to Jill and Toby. After they give him Jake’s name, Walter compels Jill and Toby to kill each other in a crowded restaurant. Roland explains to Jake that if Walter destroys the tower, the darkness and demons surrounding the universe will be invited in to destroy multiple worlds. Roland rescues Jake from visions of their fathers that turn into monsters, along with several other creatures from beyond the tower’s protection. Laurie and Lon return home to find Walter in their kitchen. Walter kills Lon and forces Laurie to show him Jake’s drawings. Walter returns to Mid-World to task Pimli and Tirana with going after Jake. Roland and Jake reach a village where a seer named Arra identifies a building in one of Jake’s drawings as Walter’s main base in the northern wastelands. Because that territory can only be entered from one of the portals Walter’s people control, Roland asks to use the village’s portal to return Jake to New York. From there, he and Jake plan to use the Dutch Hill portal to reach the wastelands. Walter’s minions overrun the village. Roland fights them off before escaping through the portal with Jake. Walter burns Tirana’s face in frustration when Pimli reports that Roland and Jake disappeared. Walter visits the village and kills Arra after learning where Jake and Roland went. In New York, Roland is briefly treated at a hospital for a wound suffered earlier. Jake returns home to discover that Walter murdered his mother. Jake takes Roland to a gun store for bullets. Walter distracts Roland with a confrontation while his acolytes capture Jake. Walter returns to Mid-World with Jake. Pimli straps Jake into a machine intended to harness his shine for destroying the tower. Roland battles Sayre and more of Walter’s acolytes back in New York while trying to reach the portal. Although the technicians shut down the portal, Jake uses his powers to keep it open for Roland. Walter steps back through the portal to confront Roland once more. Their fight ends with Roland shooting Walter in his head, rescuing Jake, and blowing up Walter’s Mid-World base. Roland offers for Jake to return to Mid-World with him to learn the ways of a gunslinger. With nothing left for him in New York, Jake agrees. Plenty of reviews, editorials, and assorted takes have exhaustively covered how “The Dark Tower” fares as a 90ish-minute adaptation/sequel/prequel/companion/whatever-you-want-to-call-it of the Stephen King series spanning four decades of novels, comics, and multimedia. Common consensus among those Dark Tower devotees concludes that the movie squanders so much potential, it’s a misguided disappointment at best or a massive failure at worst. No need exists for one more mouth to lament the book-to-screen couldas, shouldas, and didn’ts, other than to ask out loud, why bother securing film rights to 4,250 pages of material just to boil everything back to basic strokes of standardized fantasy fiction? If producers only wanted a generic star vehicle maximized for mainstream appeal, they could have built a suitably empty vessel from scratch instead of exploding a rich foundation their film routinely fights against. By consciously choosing the least risky, most predictable path at every creative juncture, “The Dark Tower” distills a mammoth amount of mythology into a colorlessly mediocre movie. For something defining both the film and the franchise, the titular tower is nothing more than a mere MacGuffin here. It could be any kind of bauble, serving as an interchangeable object over which the hero, villain, and audience surrogate clash. Considering that nothing short of the entire universe’s destruction is at stake, it’s surprisingly scandalous how small and hollow “The Dark Tower” feels. Jake Chambers’ psychic sensitivity has him seeing visions of this tower along with a gunslinger and a man in black battling over the odd building’s fate. Like the tower, Jake exists purely to play indentured servant to the story, having no backing behind his development that isn’t immediately useful for drawing a line between plot dots. Without defining characteristics adding a second layer to his flat personality, poor Tom Taylor can be forgiven for having no choice but to play the boy as a gape-mouthed lump. Idris Elba at least has the luxury of falling back on natural charisma to put a faint twinkle in the eye of gunslinger Roland. Elba cannot fall back on the script for additional aid however. The problem with being a gunslinger is that action rarely requires Roland to do anything more explosive than pointing his weapons and pulling their triggers. Roland’s dash of charm comes courtesy of several stale “stranger in a strange land” moments, such as when Roland wonders if ammunition might be scarce on Earth and Jake, knowing he is escorting Roland to Brooklyn, gets to laughingly roll his eyes. If ironic meta-commentary doesn’t tickle your unfunny bone, Roland also ponders the important mysteries of hot dogs, Coca-Cola, and talking animals in TV commercials for more half-hearted “fish out of water” hysterics. As the last of the gun-toting Jedi in his world, it falls to Roland to protect Jake when an otherworldly gateway transports the boy from New York. Together the two of them hit a trail that has them running alternately to and from Roland’s nemesis in black, who goes by the fearsome bad guy name Walter. Walter’s sorcery sees him felling foes with whispered words, making his visual villainy even less conducive to cinematic intensity than Roland’s ho-hum bang-bang heroics. It comes as no surprise then that the duo’s climactic confrontation becomes a boring ballet of bullets and broken glass. 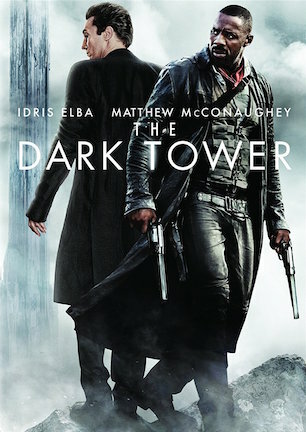 Two top acting talents embody two titans of fantasy fiction and the best “The Dark Tower” can do is pit them in a flaccid faceoff of wrist flicks and stink eye stares. Jake wants to find out what his visions mean. Roland wants revenge for his father’s murder. Walter wants to destroy the tower using Jake’s power, which will allow darkness to destroy infinite worlds, presumably benefiting Walter in some way. Walter’s more immediate motivations on the other hand, are a bit murky. When Jake comes to Mid-World, the realm where the gunslinger and man in black dwell, Walter deems it best to go to Earth to verify exactly who this boy is, even though in all other instances he is a capture first, question later kind of guy. It’s similarly astonishing how Walter knows the way to really rip Jake is to murder his mother. Yet when Jake later takes Roland back through the portal, Walter can’t guess where the homesick boy went, forcing Walter to fatally interrogate someone regarding Jake’s whereabouts first. Never has omnipotent evil been depicted as this dim. “The Dark Tower” dies a slowly agonizing death by a thousand paper cuts. In this case, those thousand cuts clearly come from reported reshoots, reedits, focus group futzing, script drafts, studio notes, asterisks, and other meddlesome ifs, ands, or buts whittling “The Dark Tower” down to nearly nothing. Or, nothing that resembles the source material, much less a sensible standalone movie. In its effort to be universally accessible and inoffensively adequate, producers cut together an uninspired effort alienating diehard Dark Tower fans and none-the-wiser newcomers alike. December 22, 2017 by Ian Sedensky.